What happens if you unwrap a bar of Ivory™ soap and microwave it? Will the soap melt? Try this fun experiment and find out for yourself! This experiment demonstrates closed-cell foam formation, physical change, and Charles' Law.Please note that your microwave will not get destroyed; it will just smell flowery for a while! 1. Get the 2 pieces of Ivory™ soap. 2. You can place either one piece or both pieces of soap on a paper towel or microwave-safe dish. 3. Turn the microwave on high for about a minute or less. Keep a close eye on the soap to watch what happens. 4. If you microwave the soap longer, nothing bad may happen, but the soap does not continue to grow. Let the soap cool for a minute or two before touching it. 5. The soap will feel brittle and flaky, but as it is still soap, it can be used to clean. You can use it in the shower or as a laundry soap. (We have not tried this). A foam is any material that traps a gas inside a cell-like structure. Materials like shaving cream, whipped cream, Styrofoam™, and even bone are called foam. Foams can be squishy, fluid, solid or rigid. Many foams are polymers, (like Glue in our Glittery Slime experiment) but the type of molecule is not what defines whether or not something is a foam. Ivory expands into a foam that is more than six times the size of the original bar. It's a fun trick that won't hurt either your microwave or the soap. The soap trick can be used to demonstrate closed-cell foam formation, physical change, and Charles' Law. When you are heat the soap, it is softened. The microwave makes the the air and water trapped inside the soap to also heat up, causing the water to vaporize and the air to expand. The gases expand and push on the softened soap, causing it to expand and become a foam. Popping popcorn works in much the same way. 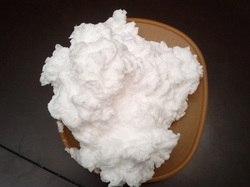 When you microwave Ivory™, the appearance of the soap is changed, but no chemical reaction occurs. This is an example of a physical change. It also demonstrates Jacques Charles' Law, which states the volume of a gas increases with its temperature. The microwaves impart energy into the soap, water, and air molecules, causing them to move quickly and further away from each other. The soap puffs up. The air that causes Ivory™ to be less dense than water has been whipped into the soap, so you won't see bubbles or pockets of air. This is the reason why the Ivory™ soap experiment works. 1. Does a bar of Ivory™ float in water. 2. Try this experiment with other brands of soap. Do they float or sink? 3. Cut a piece of Ivory™ and examine it closely. Do you see any air pockets? Try microwaving other brands of soap and send us pictures of your conclusions. We will publish it on our website. Ensure that you wash your hands after playing with the soap so that you do not accidentally eat it (though it's not toxic) or get it in your eyes (which would cause burning).